We are all forgetful sometimes. That’s why we set reminders to make sure we aren’t oblivious to something important that we need to recall so we can take action. Forgetting to take one’s daily vitamin is not a major catastrophe, but when advanced age is combined with chronic health conditions, failing to take one’s pills as directed can be downright dangerous. An Assisted Living Community like Rosewood of Fort Oglethorpe is similar to that reminder we set on our calendar or smartphone. Our nurses work with residents’ physicians to add and adjust medication times to the daily mix of activities. This gives a senior’s family the peace of mind that an aging parent is taken care of and won’t skip a round of meds due to getting distracted or forgetful. Residents love the fact that they no longer have to occupy their thoughts to keep track of dosage times and amounts. In some cases, a scary event is the impetus for a senior moving into an Assisted Living community. We are relieved that Rosewood can provide a solution to prevent this from happening repeatedly. A lot of Emergency Room visits can be traced back to such incidents. Rosewood takes the onus off of the adult children from running each month to the pharmacy to pick up new medications, plus having to change medications because a doctor had discontinued a particular medication. We take care of all of this with our pharmacy, saving the family member time so they can focus on spending their time with mom and dad. Drug interactions can also be a risk when it comes to seniors and their medications. In some instances, a resident may have visited several doctors over the years, including specialists. One doctor may not know another one has prescribed a medication which could result in an adverse situation. Our nurses review all medications and can make proper recommendations to the doctors, intervening before a critical situation arises. We also have a full list of medications that we can send with residents when visiting a new doctor, for review before making any changes to their medications. The medications are set up professionally in what we call, “blister packs.” Similar to over-the-counter medications, each is packaged in plastic and sealed on the back, where you pop the medication out of its container. Each medication lists on the back the resident’s name, the medication, what it is for and the time it must be administered. Our residents get their medication on time, the right time every time! The importance of such safeguards cannot be overestimated, especially when the resident may have an impaired cognition or make choices in a confused state of mind. 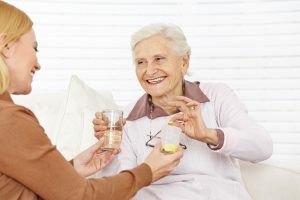 The great thing about Assisted Living is that it provides this degree of health care services as a more affordable alternative to nursing homes, which are designed for 24/7 medical treatment in a hospital-like environment. Rosewood, in contrast, feels like a home setting and offers much more freedom while also keeping residents safe and secure. There is consideration for other aspects of health as well, such as keeping seniors active and moving with scheduled exercise classes and other programs. Nutrition also factors into keeping a watchful eye on the residents’ well-being. A doctor may supplement medications with dietary recommendations to avoid complicating chronic conditions. Because medications are critical when treating conditions like heart disease, cancer, diabetes, stroke and lower respiratory diseases, our staff undergoes extensive training to provide quality and excellence in care. Beyond this, we grow familiar with how residents react on good days compared to how they may react when experiencing discomfort. Rosewood can provide seniors with transportation to doctors’ offices for treatment, without a family member having to take time off work to serve this need. Our residents are precious to us. Rosewood is pleased that we can offer medication reminders and other services to keep them active, while also managing their health conditions. To learn more about Regency Senior Living, call 706-866-4443.